Expand the client base to reach a younger, more-tech savvy audience while maintaining the integrity of the brand and high standards of excellence. CarusoPR redesigned Dance Gallery’s brand offering a fresh updated look and vibe to the logo. We carried the theme to signage, print advertisements and a complete overhaul of an existing 10 year old website. The new branding concept offers a clean, professional presentation that works elegantly across digital and print formats. We reflected the high standard of quality and excellent professional dance instruction throughout the rebranding process, keeping the entity’s mission in solid focus. To bring the business to digital life, we captured hi-res lifestyle photos of the students, professional dance instructors and appealing original dance themed artwork found throughout the studio walls. We chose to use black and white images to add impact to the artistic design of the website. We developed new features and functionalities for the website creating streamlined access to information and ability to perform tasks. We included an online registration program and integrated blog along with custom social media channels to encourage ongoing engagement with new and current students further developing and advancing the dance community. New business cards and refreshed ad campaign were part of the rebranding package. CarusoPR continues a media relations program highlighting key storylines about student achievements and community events. 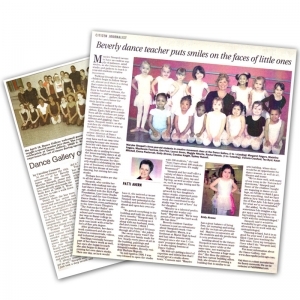 A footnote: Dance Gallery is one of CarusoPR’s oldest clients beginning with us as they opened in 1998. Dance Gallery Chicago’s business increased by 33 percent in the first six months of the rebranding. Dance Gallery now reaches students from the core community as well as expansion into new demographic areas. The new website has lead to an increased and ongoing demand for additional often new types of dance classes, services and dance related product development also generating increased business growth and new revenue opportunities.